AT’s Beth Peglar visits the new Sticky Rice Cooking School in the Adelaide Hills and discovers the perfect balance of food, design, flavours and personalities. Sunlight streams in through large windows behind a beaming, imported, three-tonne Buddha. What was once a 1940s hot spot for floral-printed farm wives is now the Sticky Rice Cooking School, a zen-sational and spacious shrine to divine dining and wok frying in the Adelaide Hills. And it’s on this particular morning that I’m about to encounter South Australia’s newest (and perhaps finest) cooking class: a sumptuous lesson in Thai cuisine, tucked away slightly off the beaten track in the petitely pleasant town of Stirling. Being quite a fan of the hills and a reasonably local resident, I can think of no good reason why I’m currently lost. From the CBD, Stirling is only a half-hour drive up the main highway. However, feeling a tad adventurous, I’d started the ascent further south along an almost road-like squiggle, immersing myself in complete and calming dense eucalypts and wild hill wonders. Having taken the road less travelled through some of SA’s most beautiful natural surrounds, I soon found myself completely befuddled and, most unfortunately, mapless. At the first signs of human existence I pulled over to ask a faithful mum from a Scott Creek school to point me back on track. Even after reaching Stirling I found myself driving back and forth on the wrong road looking for the seemingly non-existent Number 96. Somewhat embarrassed, I decided to phone the friendly and knowledgeable cooking school owner, Claire Fuller, and admit defeat. Within minutes I was finally pulling up alongside the stone god on Old Mt Barker Road. Inside, Asian antiquities of mortar and pestle, rice bowls and woven baskets juxtapose the neatness of carefully placed metallic knives and cutting blocks atop sleek stone benches. A red lacquered floor lies below. 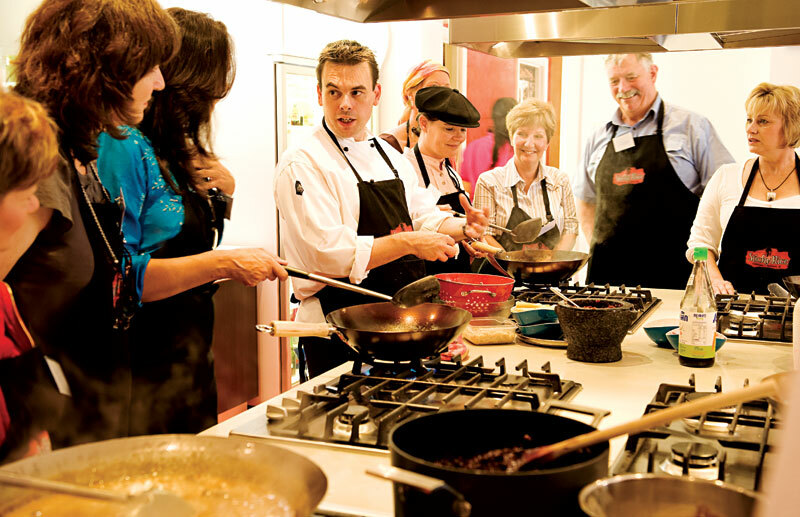 The class begins around a lavishly ingredient-topped table, where master chefs Kelly Lord(of Queensland’s Spirit House Restaurant) and Kurma Dasa, vegetarian TV guru, present a hands-and-nose-on experience. There lies garlic and galangal, shrimp paste and peppercorns, dried mushrooms and mandarin. 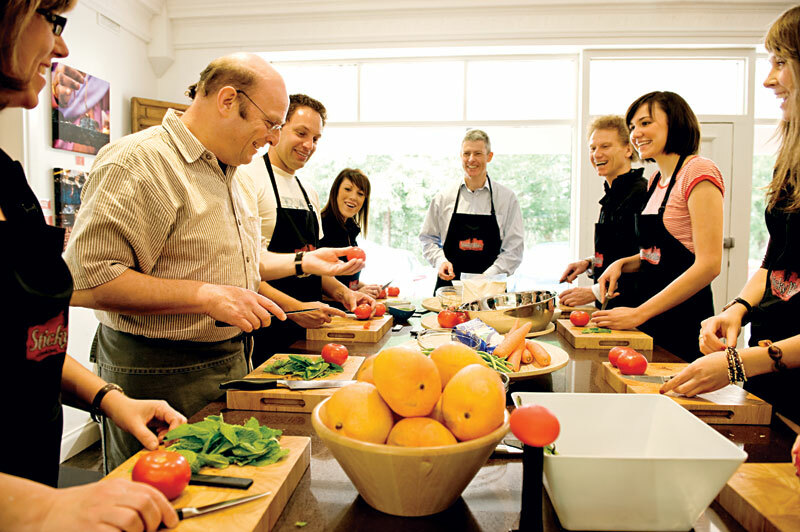 In a class of nine, we each sliver snake beans and slice shallots, carefully and patiently guided by our teacher. 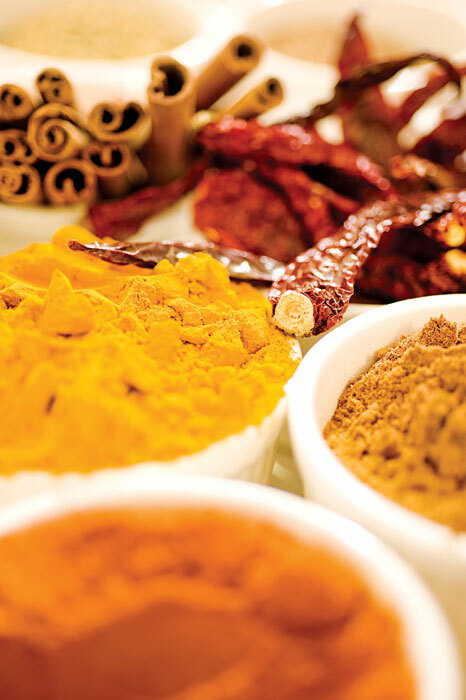 With grinding and pounding in weighty mortars, intense tangs and smells of fresh spices come alive. Red curry paste and hot and sour dressings are prepared for our later Thai beef salads and chicken curries. Thick coconut cream froths in nearby woks, seasoned with fish sauce and palm sugar. Both class and venue are sublimely sensual, balancing like true Thai flavours: salt with heat, sweet with sour. Fragrant wine, lager and lightly spiced Cassava crackers are on offer for an early break, followed by intermittent yet complete three-course dining in a delicious and merry manner. Nearing the end of class, tiny white tapioca pearls simmer until transparent, and with a sense of achievement and collaboration, both people and food have come together. Everyone is more than content and has said that they will return. 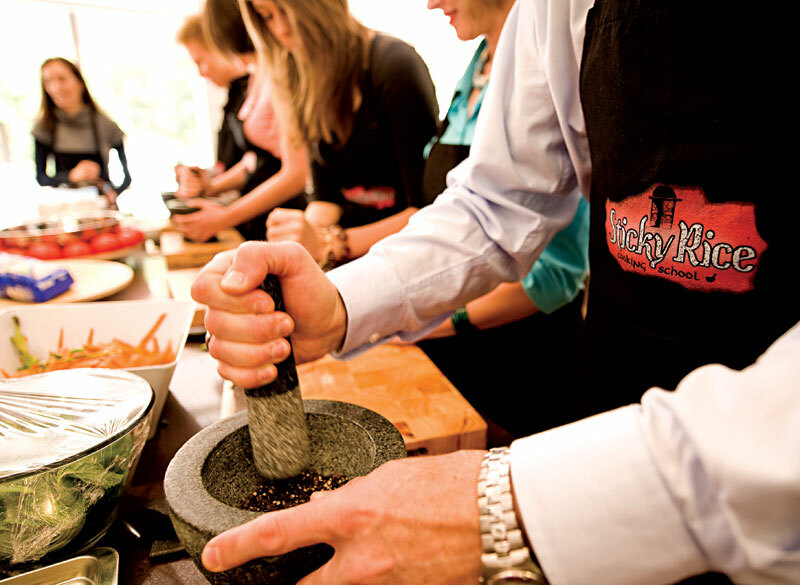 The Sticky Rice Cooking School has proven to be an innovative place of change, transformation and balance, in both food and design. “Cooking journeys for food lovers,” they’d promised. It is that and far, far more. Where // 96 Old Mt Barker Rd, Stirling. Notes // Classes begin at $125 per person.